On Tuesday the 19th of September 1944, a total of 101 Short Stirling bombers and 63 Dakota's left the UK, heading for Arnhem, The Netherlands. They were tasked with dropping containers and baskets with ammunition, fuel and food to British and Polish ground troops. The planes met intense Flak fire. 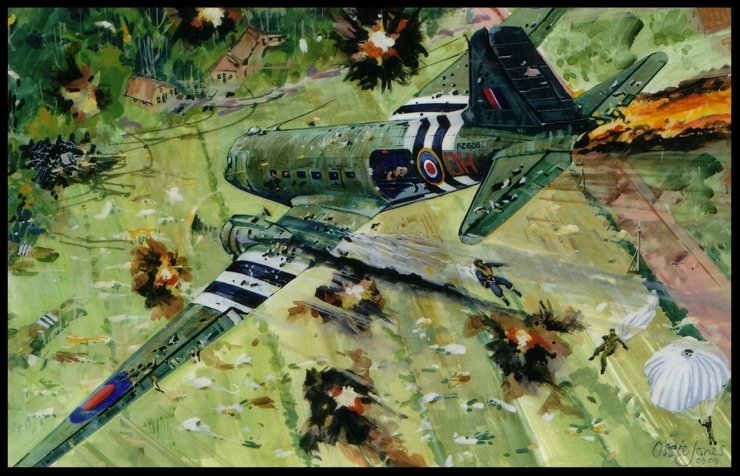 A staggering number of 97 planes were hit by Flak on the way to Arnhem and above the drop zones. 11 Stirlings and 8 Dakota's did not make it back home. This is the story of one of them: Dakota FZ626. Dakota FZ626 was flown by Pilot Officer John (Len) Wilson, Flight Sergeant Herbert Osborne (Co-Pilot), Flight Sergeant Reginald French (Wireless Operator), Warrant Officer Les Gaydon (Navigator) and air despatchers Lance Corporal James Grace, Driver Richard Newth, Driver Vince Dillworth and Driver Wilfred Jenkinson. Wilson had flown several missions over Arnhem on the days before the 19th, dropping paratroopers. FZ626 took off from RAF base Down Ampney at 12.35 pm, heading for supply dropzone 'V' or 'Victor', on the northern outskirts of Arnhem. FZ626 joined a large group of aircraft. The force was composed of 63 Dakota's from 271 and 48 Sqdn based at Down Ampney and 575 and 512 Sqdn, based at Broadwell, squadrons leaving the respective airfields in that order. FZ626 carried 16 panniers, containing fuel and food. The Germans turned out to be well informed about the position of the drop zone where FZ626 was heading. In the morning of the 19th a German Flak unit put up an air trap, consisting of four 20mm guns and at least one 88mm gun in the far east corner of the drop zone. In the afternoon the guns took down several Short Stirlings above 'V'. The formation of Dakota's of 271 Squadron, being the last group of aircraft to make the dropping run on 'V' in the late afternoon, were not aware of the experiences of their colleagues and consequently ran into the same Flak as encountered by the group of Stirlings above 'V' earlier that day. Dakota FZ626 arrived at 'V' around 16.30 pm local time. FZ626 descended to 500 ft (150m) at a speed of 120 mph (190 km/h) , to be able to safely drop its load. It got caught in the fire of the German guns, being the first Dakota of this run over 'V' and was fatally hit. Instead of turning the aircraft away from the gunfire, Len Wilson decided to fly the crippled aircraft directly towards the German guns. The aircraft came down right behind the positions of the 20mm Flak, crashing on a house and, as an eye witness recorded, hitting one of the German guns and cutting some birches in half. The explosion of the aircraft and the fuel in the panniers caused huge disarray amongst the guncrews who were witnessed running from their positions in a state of panic. Together with Len Wilson and Herbert Osborne the crew members Reginald French, James Grace and Richard Newth were killed in the crash of their Aircarft. Gaydon, Dillworth and Jenkinson cleared the burning aircraft in time by parachute and then taken prisoner by the Germans. One of the damaged birches is still present today at the Bakenbergseweg on the location near where the Flak Gun was situated. This tree is silent testimony to the bravery of the pilot, clearly showing where the aircraft hit the crest of the tree. The courageous men who died on this spot are remembered by a green quartzite stone, placed in the eastern corner of drop zone 'Victor', some 50 yards from the birch and the house where FZ626 crashed.